Two scientists, a few laughs, some weird concepts and a couple of ideas to help you survive life’s turmoils. 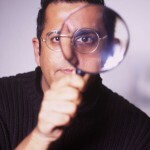 This was an experiment initially supported by NESTA, hosted by the Soho Theatre, and then backed by the Royal Society. The idea was to make science lectures theatrical and to present them in a mainstream venue. The results have been shockingly positive, with great reviews and sell-out runs in London and beyond. You can read about the two different shows below. The first show toured London, Edinburgh and Newcastle, while the second one went to London, Dublin and New York. Richard Wiseman and I took Theatre of Science to the Edinburgh Fringe in August, 2002. It was great fun mingling with the comics and actors who were also performing at the Pleasance, and it was an excellent opportunity to take the show to a new audience. The lovely thing about a Fringe audience is that they are up for anything – even lectures about mathematics and psychology. A million volt bolt of lightning was created for the first time ever on a theatre stage by Richard Wiseman and Simon Singh. The acclaimed duo put their lives at risk as six foot long sparks arced between two specially constructed transformer coils in a show that turned back the clock to a time when audiences attended the theatre to see dangerous scientific demonstrations as entertainment. With the audience seated just a few feet from the sparks, the production involved negotiating over £12 million of insurance. As a finale to the show, one of the performers entered a coffin-shaped cage and absorbed the full force of the strikes. There is no room for error as the bolts of lightning are potentially lethal. The show also explored the remarkable anatomy of Delia Du Sol, one of the UK’s top contortionists, as she performed live, demonstrating impossible body bends and squeezing into a tiny Perspex cube. Live music was provided by sonic artist Sarah Angliss, who demonstrated the singing saw and other acoustic curiosities. Sarah was also joined musician Stephen Wolff to perform the world’s only theremin duet. The theremin is played without touch but by moving around in its electromagnetic field. Find out more by reading this article from Guardian Comment or the Times Review (“The spirit of Houdini lives on”). This snapshot shows what happened when I was zapped by lightning live on stage during Theatre of Science 2005. 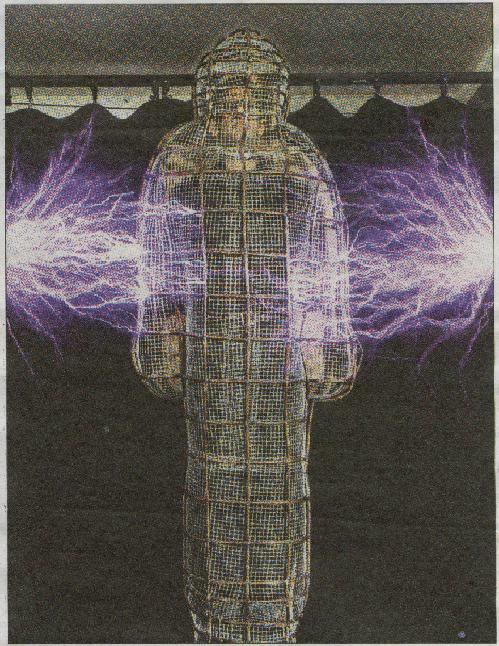 You see me standing in a metal mesh cage, which is my only protection from two giant Tesla Coils and the million-volt lightning bolts they produce. The lightning bolts did hit the cage, but were conducted safely across the metal surface without flowing through me.